Adding a link, getting error "missing column..."
Can I open desktop applications through entree? Only show "birthdays" or "new employees"
The colleagues widget is a simple tool that can enhance the connection with the organisation for employees simply by sharing the growth in employees and who is celebrating their birthdays. You can choose to show both, or just birthdays or new employees. This article is about the use of the employees widget. To enable the widget and make it visible on home you need to turn it on in the admin panel. Read more about this in the Configure widgets article. The colleagues widget is fed by an employees file (employees.csv) that contains the names and birthdays of your colleagues as well as their start dates (new colleagues input). Preferably this file is managed by HR as they are probably the ones that knows about all the (new) colleagues. Start by adding the names of your (new) colleagues to the file in the given format. You can do that by downloading the employees.csv file in the MED folder of the application. You can find it by going to site content in the SharePoint menu wheel. Choose MED folder and download the file. Or you can find it here. 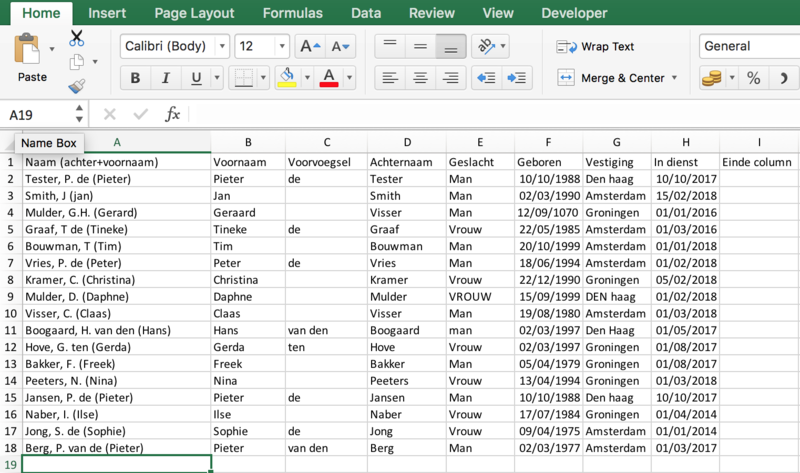 Use excel to adjust the CSV file with the data of your colleagues. Do not change the titels or order of the columns. further make sure that dates are written in dd/mm/yyyy format. Of course it is up to you if you fill in all columns or choose to do the naming differently. So for instance use "Pieter" or "Pieter de Tester" rather than the formal form there is now "Tester, P. Pieter". This is also the name as shown on home for birthdays. Save the file when you are done. You can verify the input by opening the csv file in a text editor to see if the dates are saved in the right format dd/mm/yyyy. When you are done, upload the employees file into the MED folder. Make sure the name is employees.csv, adjust the name by right-clicking the item in the MED list if necessary. The data will now be read automatically by the widget and show the amount of new employees and birthday celebrators on home. Should you wish to only show one of the options, adjust this in the widgets settings. Go the admin panel and choose Widgets Config. Go to colleagues and turn off the row you to not wish to display, click ok and click save settings. The application will refresh itself and the data will be visible on home. If after the refresh the colleagues widget is not visible on home, it can be that it is turned off. Go back to the admin panel, go to Home Config and choose widgets. Here you can turn on the colleagues widget and choose the order of the widgets. You can read more about this process here.